The Columbia Chamber values its Partners and our shared commitment to making the Midlands a place where all can flourish. As a Partner in the Chamber, one of tools available to you is the Partner Portal. It’s an invaluable way to put your Chamber investment to work and extend your marketing exposure. Every Chamber Partner has a unique username and password to access the Partner Portal. 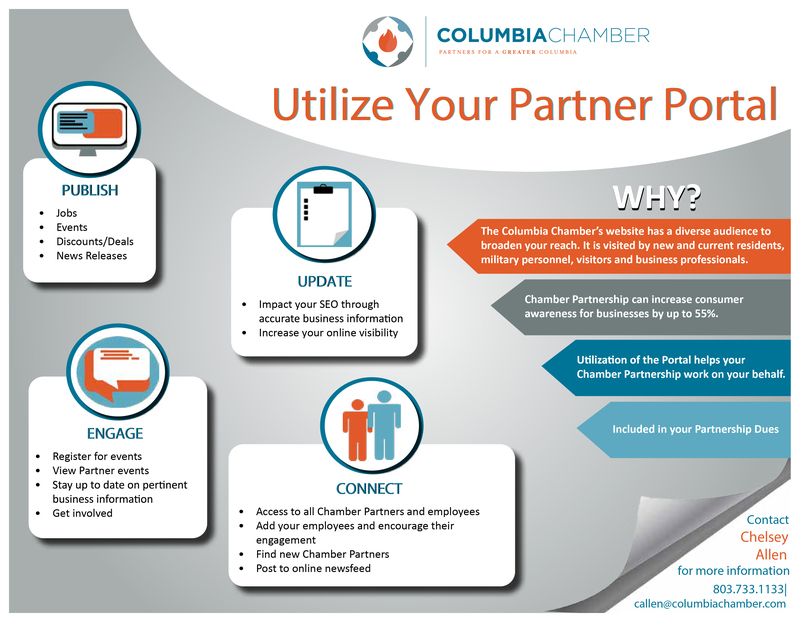 The Partner Portal login page can be accessed through the Columbia Chamber’s website homepage or can be found in the link below. If you are a Chamber Partner and do not know your login credentials, please contact Chelsey Allen by email or at (803) 733-1133. Take the time to login and update your information and add your social media data. The Chamber would like to make using the Partner Portal an easy experience and has created step-by-step video tutorials on how to perform the actions above, please see the links below to watch. If there want additional information or have any issues using the Partner Portal, please contact Chelsey Allen by email or at (803) 733-1133. If you are interested in taking advantage of the Partner Portal, and are not a Partner of the Chamber yet, Chelsey can assist with that as well.